There is an increasing interest in the study of indigenous people and their cultural practices in the recent years, due to the pressing need for indigenous psychology and culture-specific psychotherapy. The ancient time-tested traditional approach to healing is often seen as holistic, in contrast to the Western medical models that focus solely on the physical aspect. It is a common belief among indigenous communities that illnesses are a sort of war waged by spirits, be it a witch, demon, sorcerer, a spirit of an ancestor or one’s own spirit, possibly seeking retribution for acts of commission or omission. Because of this worldview, people expect healing to be brought about, not merely by technical, clinical procedures or chemical concoctions but, with customary rituals in tune with their belief system. Thus, their religiocultural worldview plays a vital role in understanding existential problems and health practices. The cultural diversities of indigenous communities and the need for culture-specific psychology are often neglected due to resistance from many Euro-American scholars and their lack of openness to ethno-cultural groups and ideologies. Although Western theories of human behavior originated to fit into a specific cultural context of its proponents, the diversity of cultures, the socio-economic setup and other belief systems around the globe forbade blind implementation of such theories in Asia, Africa and other similar cultures. Some Western psychologists argue that the study of culture and ethnicity belongs to the field of anthropology and psychology has nothing to do with the cultural differences in applying the theories of human behavior across cultures. Understanding the concepts of health, illness, psychological distress and other existential issues of countless ethno-cultural groups would enable mental health professionals to do quality therapy by identifying and solving many culture-specific mental health issues. So there is a need today to study the indigenous cultures and their worldview to deploy culture-specific psychotherapy. In the realm of psychology, culture has been used to study human behavior at various levels of understanding by cultural and indigenous psychology, cross-cultural psychology, and multicultural psychology. Cross-cultural psychology tends to compare two or more cultures on a number of variables to discover similarities and differences in psychological functioning, while cultural and indigenous psychology is interested in understanding how human mind and culture define and constitute within socio-cultural contexts; further, they explore indigenous conceptions and ethno-theories, culture-specific worldviews, and collectivistic moral value systems in different parts of the globe. Multicultural psychology focuses on the psychological development among members of different groups (racial, cultural) and commonly used today to understand minorities and immigrants within a given society. Many cross-cultural psychologists, emphasize that at least some psycho-development processes are universal in nature otherwise cross-cultural comparisons would be impossible. Thus, cross-cultural approach ventures into critical and comparative study on how culture affects human behavior, to identify universal principles for psychology. The rise of cross-cultural psychology reflects a more general process of globalization in the social sciences that seeks to purify specific areas of research that have Western bias. Yet another bottom-up approach in studying human phenomena and existential concerns is the indigenous psychology that utilizes knowledge, skills, beliefs and concepts that people have about themselves and apply them in understanding their behavior. This culture-specific, relativist perspective tends to clash with the absolutist/universalist perspective in most fields of psychology. The absolutist perspective that human behavior can be generalized all over the world is almost obsolete today. Cultural psychology believes that culture and human behaviors are inseparable and therefore no universal laws can fully explain human behavior; psychological theories grounded in one culture are likely to be limited in applicability in another culture is gaining popularity. I foresee that this century would be the time of culture-specific psychology which focuses on individual culture or indigenous groups and not concerned with cross-cultural comparisons. Cordillera indigenous people, collectively known as Kaigorotan (Igorot peoples) in the Philippines live in the northern part of Luzon Island primarily in Benguet, Mountain Province, Ifugao, Abra, Apayo and Kalinga provinces. For the lowland Filipinos, all the indigenous communities in the Cordillera seem to be similar and thus the collective name Igorot was popularized; whereas, for the native Cordillera people, this collective identification does not give any meaning and they prefer to be identified by their own indigenous names and identities. The whole Cordillera people in the Philippines could be divided into six major subgroups, namely Ibaloy of Southern Benguet Province, Kankana-ey of Northern Benguet and Western Mountain Province, Bontoc of Mountain Province, Ifugao of Ifugao Province, Kalinga of Kalinga Province, Itneg or Tingguian people of Abra and the Isneg living in Northern Apayo Province. These indigenous Cordillera communities have a homogeneous identity in socio-cultural traits, religious beliefs, and a household deity called anito. They are known for their rice farming and the magnificent rice-terraces in Ifugao and Mountain provinces. Although popular for their headhunting practices in the past, no communities adhere to this practice today. The traditional Cordillera religion has its own cosmology. The supreme God is often identified with the sun and lives in space, referred to as Kabunian and in other names as per the specific indigenous community. Western influences arrived in the Cordillera through Christian missionaries in the early 20th century when churches, schools and hospitals were established in Benguet and Mt. Province. Missionary activities encouraged Christian practices, prayers and rituals. The alien practices were given undue preference over traditional cultural practices and thus indigenous cultural praxis became exceptionally dormant and behind the scene activities. This further paved the way for museumization of Cordillera traditional practices. Today only a small minority of people practice pure traditional native religion and the majority follow a conflated or mixed version of Christianity and native religion. 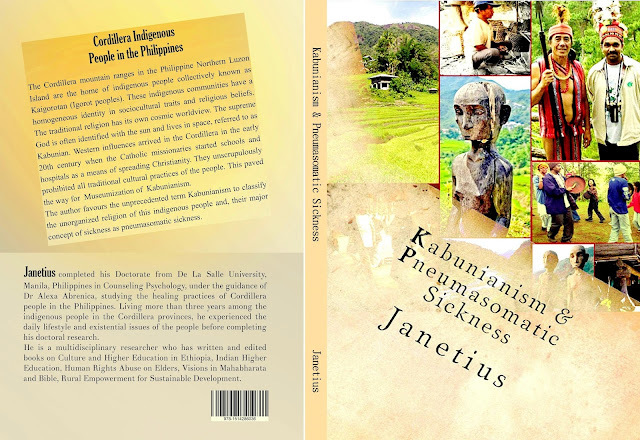 In this book, the author uses the unprecedented term Kabunianism to name the unorganized religion of Cordillera people and their sickness pneumasomatic. Taking into consideration the present need for culture-specific psychology and indigenous theories and therapy models, this book is intended to identify the emerging worldview of Cordillera indigenous people and their health concepts to integrate them with the mainstream psychology for new vistas and better psychotherapy.